General view, east end from southeast. Left to right: southeast transept, south choir aisle and presbytery behind, east end of Trinity Chapel. Bays 1 and 2. East end of south choir aisle is to left. Juncture, Trinity Chapel and south choir aisle. Juncture of east wall of south choir aisle (at left) and south wall of Trinity Chapel (at right). Detail, juncture, Trinity Chapel and south choir aisle. Closeup of juncture of east wall of south choir aisle (at left) and south wall of Trinity Chapel, bay 2 (at right). Trinity Chapel, south wall, bay 1. Parapet, Trinity Chapel, south wall. South choir aisle, east end. Juncture, Trinity Chapel parapet and south choir aisle gable. Left to right: vestry, southeast transept, east wall of south choir aisle, presbytery gable above, east wall of Trinity Chapel. Trinity Chapel, general view from east south east. Showing three gables at east of Trinity Chapel. Gable behind is presbytery gable. The division into three gables on exterior is articulated on interior by two narrower vaulted aisles on sides of central vaulted space. Trinity Chapel, east wall, lower portion. South consecration cross, east wall. On buttress of east wall, Trinity Chapel. Center consecration cross, east wall. At center of east wall, Trinity Chapel. North consecration cross, east wall. Windows, Trinity Chapel, east wall. Gables, Trinity Chapel, from southeast. Each of the three gables has windows. Presbytery gable visible behind. Gables, Trinity Chapel, from northeast. Gables, Trinity Chapel, from east. Windows, central gable, Trinity Chapel. East end gables, view from east north east. Gables from left to right: Trinity Chapel, presbytery (behind), and north choir aisle. Northeast transept is visible to right. Gables, Trinity Chapel, from east north east. Closeup view of east wall gable of presbytery. East face of tower behind. Closeup view of east wall gable of presbytery. Showing buttress at clerestory level; parapet. Roof at bottom of image is south choir aisle. General view, east end from east north east. Left to right: Trinity Chapel, presbytery behind, north choir aisle, northeast transept. At extreme left, chapter house, then vestry, then cemetery wall are visible. Trinity Chapel, view from northeast. East and north walls of Trinity Chapel. Presbytery gable and north choir aisle gable visible to right. Northeast corner of Trinity Chapel. North choir aisle to right. Note buttresses at northeast corner. Trinity Chapel, northeast corner buttresses. Upper portion of buttresses at northeast corner. North choir aisle from east. 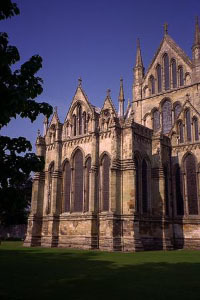 Left to right: Trinity Chapel, presbytery gable behind, spire behind, east wall of north choir aisle (center of image), east wall of northeast transept. East gable, north choir aisle. North choir aisle from northeast. Left to right: north wall of Trinity Chapel, north choir aisle (presbytery gable behind), northeast transept. North choir aisle, northeast corner. Showing north and east walls of north choir aisle, and buttresses at northeast corner. North choir aisle, northeast corner buttresses. Upper portion of buttresses. Note buttress to presbytery clerestory above. Left to right: Bays 1 and 2 of Trinity Chapel, north choir aisle, east end of presbytery. Presbytery and north choir aisle, from north. Left to right: bays 4, 5, 6 of north choir aisle, three bays of presbytery above, and northeast transept with northeast chapel. North choir aisle and presbytery, bay 5. Parapet of north choir aisle and clerestory of presbytery, bay 5. Note presbytery gable buttress. Masonry, north choir aisle, bay 5. Juncture of north choir aisle, bay 6, and east chapels of northeast transept. Showing masonry below windows. Juncture of north choir aisle, bay 6, and east chapels of northeast transept. Showing windows.